Precision irrigation specialists Valley Irrigation (Valmont ) recently launched the Bender160 irrigation system to the international marketplace. Designed for use with centre pivots, Bender160 helps growers increase the irrigated area, enabling them to be more profitable at an economical cost. Using the new benders, growers can easily avoid trees, buildings or other obstacles in the field, allowing for maximum irrigated land. Designed to easily retrofit into existing centre pivots with minor structural changes, several Valley benders can be easily installed in multiple locations on the same centre pivot and can also be used in combination with the Bender30. Wade Sikkink, Equipment Product Manager explains that the Bender160 is designed to provide growers flexibility in maximising their irrigated hectares, especially in oddly shaped fields with obstacles. The Bender160 allows for continual monitoring of the machine angle while bending, which enables growers to control auxiliary functions and end guns and provides them with more options to make sure they are getting the most out of their land and investment in centre pivot irrigation. 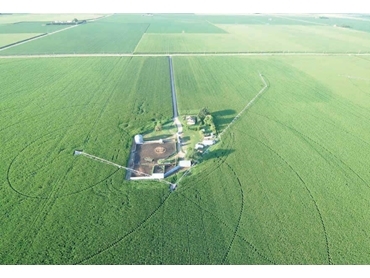 According to Scott Mauseth, International Product Manager, the Bender160 irrigation system will allow growers in international markets to irrigate areas that were not always reachable with a standard centre pivot. An exclusive speed-up timer function, which comes standard in both the Bender30 and Bender160 improves a centre pivot’s water application while bending. More than 200,000 centre pivots, linears and corner machines from Valmont’s irrigation equipment range are currently in operation worldwide, annually irrigating approximately 10 million hectares.